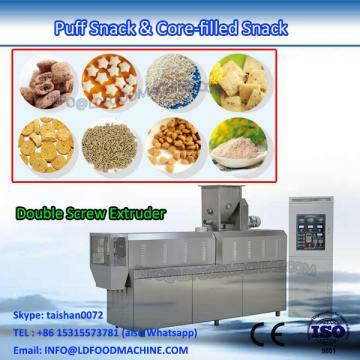 This Core-filling stick snack processing line adopts advanced co-extrusion technique, which can extrude materials in different texture and structure by double screw extruder. It can use corn, rice, and other grain powder as raw materials to produce a Variety of core-filling snacks with different core materials, such as chocolate, cream, peanut butter, sesame paste, etc. And also it can produce many other puffed snacks by changing the moulds and adjust some assistant machinerys. This core-filling stick snack processing line is characteristics of simple opeation, reasonable structure, low consumption, and high efficiency, which make it the best choice for medium factory.